While northern New Jerseyians tend to cross a bridge or tunnel for New York City Christmas events during the month of December, New Jersey has equally famous and festive holiday traditions and celebrations going on throughout the state. There's a virtual Victorian fantasyland in Cape May, along with a full calendar of annual holiday hoopla in and around Princeton, a traditional light show in Old Bridge ....plus check out what else happens in the Garden State at Christmastime from Camden all the way to the Jersey shore. All aboard the Santa Ferry Ride in Belford. • Who needs a one-horse open sleigh when you can take the ferry? 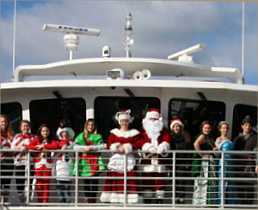 At the Belford Santa Ferry Ride, it's all aboard the Molly Pitcher for a visit from Santa and holiday caroling, Christmas goodies, and a spectacular up-close view of the Statue of Liberty in New York Harbor. • In Seaside Heights you can celebrate the holidays at the Casino Pier Holiday Party featuring an ugly sweater contest and candy cane limbo. • Throughout December, check out an underwater winter wonderland at Adventure Aquarium in Camden. The holiday estivities include an appearance by Rudolph the Red Nose Reindeer, Bumble the Abomible Snow Monster, and special guest Scuba Santa frolicking with sharks, stingrays and other sea life in Shark Realm. • New Jersey's largest walkthrough animated Christmas display is located inside Jody's Silk Florist & Patio Center at the Fairfield Home and Garden Center Plaza. The 10,000 square foot Ice Caverns include displays depicting Santa's candy factory, Disney characters, Toy Story figures, and a life-size nativity. Christmas in Morris County - Scroll down for tons o' fun going on in December with information and related links to holiday festivals, craft exhibits and celebrations in Morristown, Morris Plains, Morris Township and Whippany. Princeton Holiday Events - Comprehensive list with descriptions of Christmas concerts, chorale and musical entertainment, Nutcracker ballet performances, and tree lighting ceremonies throughout the Princeton area. Christmas in Freehold - Check out the calendar of events for December including the Menorah lighting, the Comcast holiday concert, candlelight trolley tour and more. Christmas at the Strand Theater - In Lakewood, catch the annual Nutcracker ballet performance schedule, plus other holiday shows and concerts. Dickens of a Holiday & Christmas Walk - A day of carriage rides, entertainment, shopping, and family-friendly fun in Mays Landing. Christmas in Cape May - Major holiday attraction includes weekend self-guided tours of the Cape's charming Victorian inns, churches, hotels and B&B's, along with holiday trolley rides and other December events and seasonal entertainment. Christmas at Camden Children's Garden - Check out what's going on this year for the little ones, including holiday activities and brunch dates with Santa Claus. Christmas Tree Farms in New Jersey - Browse an extensive directory of precut and choose-and-cut Christmas tree farms throughout the state including those offering free refreshments, sleigh rides and other holiday fun.